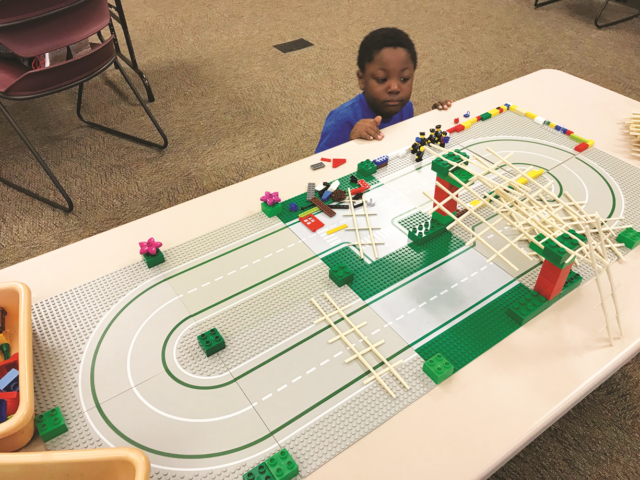 DAN MOELLER PHOTO Independent Register Declan 6, enjoys playing with one of the Lego tracks at the Brodhead public library last Thursday. Libraries aren’t just places to check out books or even videos. They are also places to foster kids’ creativity. That’s the case with the Brodhead library and its Lego Club that’s held on Thursdays from 3:15 to 4:30 p.m. Lego club isn’t a club, exactly. Participants don’t have to join something to be in it. It may feel like a club since so many of the same kids come to it weekly. That is also true of the parents who bring children to it. Children’s librarian Carol Pawlisch oversees the venture each week. She sets out bins of Legos on about a half dozen tables that are waiting for the kids to dig in and start making things with them. Also popular is a ramp in the middle of the program room for Lego cars to shoot down. What kid doesn’t like doing that? Pick up the March 20th print edition for full story….